Kayak adventurer Jim Payne, in his latest voyage, brings to life the times and thoughts of American naturalist and philosopher Henry David Thoreau. In Chasing Thoreau, Payne follows a famous river trip made by the historical figure in 1839, starting in Thoreau’s home town of Concord, Massachusetts. As he plies the challenging waters, he tracks the places Thoreau knew and revisits his theories and ideas. After solo trips on American and English waterways, recounted in One Inch above the Water (2008), Discovering England (2012), and Worlds to Discover (2015), Payne shares more harrowing and humorous adventures in Chasing Thoreau. 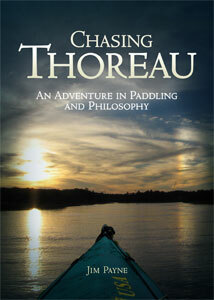 More information can be found at the dedicated Chasing Thoreau website.